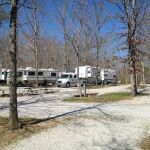 Ask fellow campers about "Bean Pot Campground" and nearby attractions. Stopped by after hours for an overnight stay. Picked open site from list, filled out simple form, placed money in furnished envelope and deposited in slot. Easy Peezee! Not a perfect or particularly roomy CG for larger rigs but served our purpose well. We camped at Bean Pot Campground in a Fifth Wheel. Former KOA. Sites are not level, side to side. On some sites, you have to navigate around a tree or two. Close to the interstate. Friendly staff. We camped at Bean Pot Campground in a Motorhome. Nice quiet part convenient to Crossville, TN. Mostly pull-throughs but some not so level. Somewhat closely spaced. We camped at Bean Pot Campground in a Motorhome. Older Campground in much need of maintenance. Inexpensive. Campground was full of mostly very old dilapidated local campers. People were friendly enough and did ok for a safe, 1-night stay, but doubt we would do it again. Single-lane rough gravel roads, uneven skinny sites that weren't really long enough, and trees too close to road and impeded putting out slides until we repositioned twice. Our site (#39) had cable, only 30 amp, and no sewer. We camped at Bean Pot Campground in a Motorhome. An older campground that has been well maintained. Very level sites with very convenient hook-ups. Excellent cable and Wi-Fi. Did not use showers or restrooms. Close to interstate but no noise. Lots of shade trees. Would stay again. We camped at Bean Pot Campground in a Motorhome. This is not a big rig friendly campground. I either had to have my car sticking out in the road some or I would have not been able to level any. I did not get level, but it was close enough for one night. Beware of the approach off of the main road, plus the narrow road to the campground. We camped at Bean Pot Campground in a Motorhome. When traveling to the West or Mid-west we have stopped at the Bean Pot Campground on several occasions. It is convenient, easy access and not expensive. We stayed in a 36ft motorhome with tow and will stay again. We camped at Bean Pot Campground in a Motorhome. Older campground that was built when RVs were smaller and did not have slides. However, it is pretty and well kept, lots of trees which are trimmed. Mostly pull- through, gravel, level sites with FHU. However, if you have a large RV you should call ahead to be sure there is a site that is long enough. Office staff was very friendly and helpful. It is convenient to the freeway but very quiet and secluded. Good for an overnight especially at the PA rate, which is cash only. We camped at Bean Pot Campground in a Motorhome. Good place for an overnight stop. No road or train noise. Easy interstate access. 15% Escapees discount. Gravel interior roads & pads. Easy to navigate in the campground. But pads appear to need some grading to level. We camped at Bean Pot Campground in a Fifth Wheel. Catfish Cabin, which is just up the road, serves excellent fried catfish. For a gourmet meal, try Stagecoach Restaurant on Highway 127 S. You have to bring your own wine. But they will cork it. Very nice people. Gave me a PPA discount for one night and GS for the second. Not many RV passing thru this time of year. A lot of seasonal campsites. We camped at Bean Pot Campground in a Motorhome. Easy access to interstate. Narrow driveway. Roads inside park are easy to navigate. Stayed here one night in 40 ft. motor home. We camped at Bean Pot Campground in a Motorhome. Our third time at this nice little campground wasn't quite as good as before. Site 13 was long and level enough not to have to unhook, but it had low overhanging branches. We chose not to use the cable but then our antenna got hung up in the branches. Had to get on the roof to disentangle it and get branches out of the way of the slide awnings. Interior roads are tight but manageable. Some long-term units not in good shape. A lot of yelling and door banging going on by nearby long-terms. Sewer didn't work well but that might have been only our site. 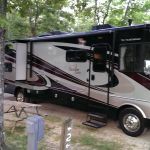 Campground owner is very nice and you can't beat the Passport America price. We camped at Bean Pot Campground in a Fifth Wheel. Very nice staff in office. Easy check-in. Long site allowing up to stay hooked up. The business west of the RV park does something with rock cutting and stacking for shipment. They start at 6 am in the morning. We camped at Bean Pot Campground in a Travel Trailer. We got a nice friendly reception and found the campground to be charming. There are several pull through spots 50 feet or longer. We have a 34 foot class A towing a small car and the site is plenty large enough. We have all the hookups, 50 amps and good cable service for the price of $28 and change including tax. Nice quiet place off the highway. It gets its name from the restaurant in town that was opened in the 1970's of the same name. The restaurant is no longer in business. A good find. We camped at Bean Pot Campground in a Motorhome. Nice wooded lot. Customer service was fair. We camped at Bean Pot Campground in a Travel Trailer. There are many things to do and explore in Cumberland County. Golfing, historic sites, hiking the mountains, waterfalls, antiques, the Cumberland County Playhouse. Only stayed one night as a stopover, but there seemed to be a lot to do in the area including golfing. Good book exchange in office...take advantage to re-stock. Visit the Cumberland County Playhouse. The productions there never disappoint. Are you affiliated with Bean Pot Campground ?